For both cupcake styles, we will cut out the full wrapper but only use half. While you could make this page with all assembled cupcakes, it will create a layer of bulk that will never show. So, to keep the page thin, we will only use what we can see. 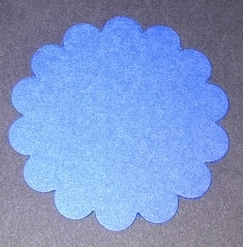 The solid blue cupcakes will be glued completely to the page. For those, then, we will cut the wrapper in half and only use the scored part with no flaps. We want this to lay flat. The polka-dot cupcakes will be assembled such that the cupcake insert will still be able to slide in and out of the pocket we create with the wrapper. We will still cut these in half, but we want to keep the half with the flaps. 1. Using the Accucut die for the mini cupcake, cut 5 copies of the cupcake insert out of white cardstock. You can emboss the frosting for something a little fancier. 2. Still using the Accucut die, cut 3 copies of the cupcake wrapper out of patterned paper and 2 copies of the cupcake wrapper out of solid paper. Cut both types of cupcake wrapper in half along the score line that creates the bottom of the cupcake. 3. Assemble the blue cupcakes by sticking the blue wrapper and the cupcake insert together. These should be glued together completely. Experiment with spacing to find the right place on the page for the solid blue cupcakes. Then, they can be glued to the page. 4. After the blue cupcakes are glued to the page, we move on to the patterned paper cupcakes. For these, we are working with the half with the flaps. 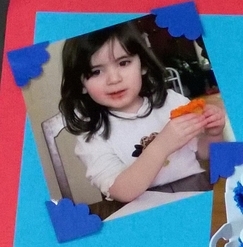 So, fold the flaps in and add adhesive to just the flaps and just where they will be glued to the background paper. Do not glue the flaps to the main part of the cupcake wrapper. 5. Once the patterned wrappers are glued to the page, make sure the inserts still slide in and out. 6. Add the cupcake toppers to the cupcake inserts that slide in and out of the patterned paper. 7. Glue the toppers for the solid cupcakes directly to the cupcakes and the page. 8. For one of our blue cupcakes, we opted for stamping and glitter, instead. This will only work for the cupcakes that won't be sliding in and out. 9. Fold each assembled cupcake in half. You can stack them, at this point, just to test that they are all identical. You can use the removable cupcakes for the names of party attendees, favorite gifts, or whatever! If you choose to skip the cupcake inserts, you can always just fill the wrappers with other items of interest. 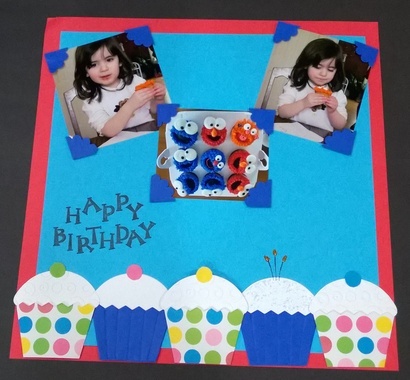 As an additional touch on this "muppet" birthday party scrapbook page, we used our scallop circle punch to create the photo corners. Just punch one circle per picture. Cut in half across the middle. Then, cut each half in half again. Viola! Photo corners! Click to go back to the Accucut of the Month Page.